Green Manufacturing; Advanced Manufacturing Process; Computer Aided Design; Rapid Prototyping; Computer Aided Manufacturing; Decision Making Tools; Composite Material and Machining Characterization; Applied Soft Computing Techniques and Optimization;Renewable Energy. Jagadish, Amitava Ray (2014) Green cutting fluid selection using MOOSRA method. International Journal of Research in Engineering and Technology, 03(03), 559-563. Sandeep Saket, Vidyapati Purbey, Jagadish, Amitava Ray (2014) Multi attributes decision making for mobile phone selection. International Journal of Research in Engineering and Technology, 03(03), 497-501. Jagadish, Sumit Bhowmik, Amitava Ray, Maran Rajakumaran (2018) Optimization of Process Parameters using Fuzzy-Grey Relational Analysis (F-GRA) for Green EDM. Proceedings of Renewable Energy Technologies: Issues and Perspectives (RETIP 2017) in Conference Proceedings of AIP, 1998, 020011-1–020011-9 (Scopus). Rajnish Kumar, Jagadish, Amitava Ray (2014) Selection of material for optimal design using multi-criteria decision making, International Conference on Materials Processing and Characterisation, held on 8th-9th March, 2014 at GRIET Hyderabad, India in Conference Proceedings of Procedia Material Science, 6,590–596. Jagadish, Amitava Ray (2014) Cutting fluid selection for sustainable design for manufacturing: an integrated theory, International Conference on Materials Processing and Characterisation, held on 8th-9th March, 2014 at GRIET Hyderabad, India. in Conference Proceedings of Procedia Material Science, 6, 450-459. Rajnish Kumar, Jagadish, Amitava Ray (2014) Selection of cutting tool materials: A holistic approach. Proceedings of 1stInternational Conference on Mechanical Engineering: Emerging Trends for Sustainability, held on 4th -18th, December 2014at MNIT Bhopal, India. ISBN: 978-93-83083-45-9. Ankurima Borah and Jagadish (2018) A Multi Criteria Decision Making Approach for Rapid Prototyping Process Selection, Proceedings of IRF International Conference, 17th March, 2018, Hyderabad, India, pp-1-5. (ISBN-978-93-87405-19-6). Book Chapter (Ch.5): - Sumit Bhowmik, Jagadish, Amitava Ray (2017) “Abrasive Water Jet Machining of Composites Materials ", Book Name: Advanced Manufacturing Technologies, Springer, (ISBN 978-3-319-56098-4),Page-77-97. Book Chapter (Ch.11):- Agnimitra Biswas, Jagadish, Rajat Gupta (2018) An hybrid MCDM method for optimization of VAWT performance parameters.Book Name: Advanced Multi-Criteria Decision Making for Addressing Complex Sustainability Issues, IGI Global, India,DOI: 10.4018/978-1-5225-8579-4. Book Chapter (Ch.9):- Jagannath Reddy, Jagadish, Biplab Das (2018) Study on Effect of Barriers in Green Supply Chain Management Using Modified SAW Technique: A Case Study. Book Name: Optimizing Current Strategies and Applications in Industrial Engineering, IGI Global, India, Page:202-219, DOI:I: 10.4018/978-1-5225-8223-6.ch009. Book Chapter (Ch. 15):- Jagadish, Sumith Bhowmik, Suresh Gudala(2018) Hybrid multi-criteria decision making optimization strategy for RP material selection: A Case study. Book Name: Optimizing Current Strategies and Applications in Industrial Engineering,IGIGlobal,Page:320-334,DOI:10.4018/978-1-5225-8223-6.ch015. Academic Experience: 5 years (From June 2013- August 2018) as Assistant Professor, Department of Mechanical Engineering, National Institute of Technology Silchar, Assam, India. 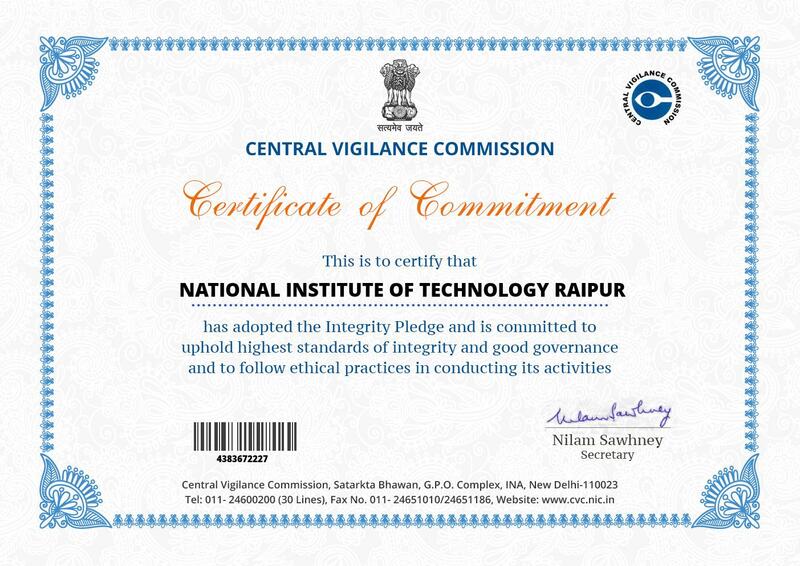 Currently working as Assistant Professor, Department of Mechanical Engineering, National Institute of Technology Raipur, Chhatisgarh, India since from August 2018. Manufacturing Process-I/II, Computer Aided Design, Rapid Prototyping, Product Design and Development, Computer Aided Manufacturing; Computer Integrated Manufacturing, Design for Manufacturing and Assembly, Product Life Cycle Management; Advance Manufacturing Process, Machine Design-I/II, Strength of Materials etc. Four days Self-Financed STTP on “MOBI ROBOTICS” organized by NIT Silchar with IIT Delhi during 21th -23rd September, 2014. One week workshop on “Computational Mechanics and Modeling (CMM 2016)” organized by NIT Silchar, sponsored by TEQUIP-II, NIT Silchar during 12th-16th November, 2016. One week STTP on “Advances in Mechanical, Industrail Engineering and Management(AMIEM-2019)” organized by NIT Raipur during 09th-13th April, 2019. Coordinator, One week STTP on “Advances in Mechanical, Industrail Engineering and Management(AMIEM-2019)”, held at NIT Raipur during 09th-13th April, 2019. Advisory Member, Five days workshop on “Fundamentals of Energy Storage”, held at NIT Silchar during 23th-27th July 2018. Coordinator, One week workshop on “Computation Mechanics and Modeling (CMM 2016)”, held at NIT Silchar during 12th-16th November 2016. Advisory Member, One week workshop on “Advanced Joining Technologies”, held at NIT Silchar during 17th-21st October 2016. Member, One week foundation course on “Advanced Fuzzy Logic” held at NIT Silchar during 1st-8th February 2016. Member, One week foundation course on “Fuzzy Sets and Fuzzy Logic” held at NIT Silchar during 2nd-6th February 2015. Coordinator, Four Days self-sponsored workshop on “Robotics (MobiRoboTics)-ROBOTRYST: 2014-15”, held at NIT Silchar during 20th-21st September 2014. One week short term course on “Failure Analysis of Engineering Materials”, organized by Department of Mechanical Engineering, National Institute of Technology Silchar during Sept 23rd–27th, 2009. Four-Day workshop on “CAD/CAM/CAE using Creo 2.0 (Pre-E)” organized by Department of Mechanical Engineering, National Institute of Technology Silchar during Aug 23rd-26th , 2013. Workshop on “Photochemical Machining” organized by boo cane and development institute (BBCDI)-Govt. of India, Agartala during Oct 03rd-04th, 2013. One week National FDP on “Pedagogy: A Framework for Effective Teaching and Learning Strategies”, organized by National Institute of Technology Silchar during May 7th-11th, 2014. Two week ISTE workshop on “Fluid Mechanics” organized by IIT Kharagpur with National Institute of Technology Silchar during May 20th-30th , 2014. Faculty Advisor for UG/PG Admission; Warden for boys hostel; Investigator for Stock Verification of other Department, Member of Anti Ragging Committe etc. The “Team of the Month award” by InfoTech enterprises Ltd. Hyderabad (Now Cyeint Ltd.) in 2012. Associate Member, Institute of Engineers India (AM159404-7) since from 2014. Member of American Society of Mechanical Engineers (ASME000101981398) since from 2015. Dr. Jagadish obtained his Ph.D. in Mechanical Engineering with specialization in Manufacturing Engineering from National Institute of Technology Silchar and Post graduation in Product Design and Development from National Institute of Technology Warangal, India. He has over 3 years of industrial experience in the field of design and analysis and 5 years of teaching and research experience. 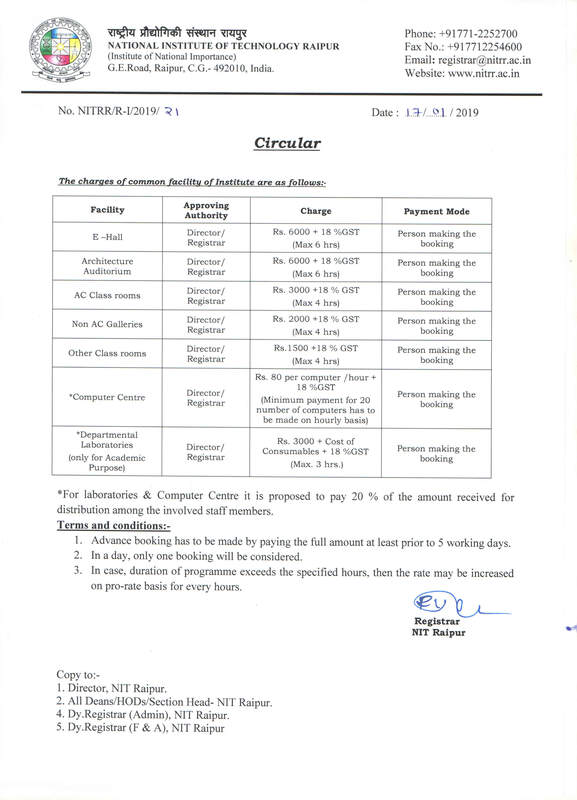 Presently he is working as an Assistant Professor in the Mechanical Engineering Department of NIT Raipur since August 2018. His areas of interests are green manufacturing, advanced manufacturing process, rapid prototyping; computer aided design, composite machining, decision making tools, applied soft computing techniques and optimization, renewable energy etc. He has supervised 08 M. Tech, 02 ongoing so far, and presently guiding 02 Ph. D scholars (as Joint supervisor at NIT Silchar). He received an “Institutional Award (Gold Medal)” by Institution of Engineers India and “Best Innovative Award” by Springer for his outstanding research contribution and published more than 14 research papers, 01 book, and 07 book chapters. He is a regular reviewer of various manufacturing and optimization related SCI indexed journals. He is the life member of professional bodies like Associate Member of Institute of Engineers (India), Committee Member of Soft Computing Club SCILAZ at NIT Silchar, Member of American Society of Mechanical Engineers (ASME).